On a previous post http://paperblog-writer.blogspot.co.uk/2013/06/play-writing-value-of-group-readings.htmlI wrote about how useful a group reading was for my stage play ‘According to Claudia'. Recently, I was very pleased and proud that the play has been selected by the Artistic Committee of Newport Playgoers to open their new season at the 400-seat Dolman Theatre in Newport this coming September. This represents a great personal achievement for me – especially as other plays in the season are by such renowned writers as Noel Coward, Somerset Maugham, Ira Levin and Richard Curtis. Illustrious company to be in! 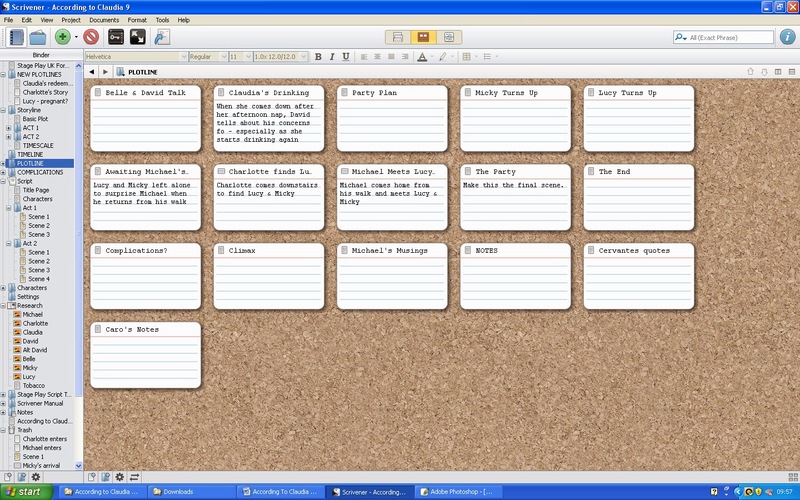 Since I purchased Scrivener some time ago I have found it extremely useful for all my writing, from novels to TV sitcoms. It’s so much more than a word processor. It has various formats for all kinds of writing, a databank where you can easily store and access all sorts of reference material from photos to character sketches – and a very useful autofill function which saves you the laborious task of filling in characters’ name every time they speak. When writing ‘According to Claudia’ I started by using the corkboard to plot the play and create a profile of each character. From there I was able to flesh out each scene in detail and then get down to the nitty gritty of writing. If I wanted to change a scene Scrivener has a useful ‘snapshot’ function which meant I could take a snap of my original scene and then revise it, knowing the first version was not lost. When I was satisfied with the final draft I exported the play as a PDF, making it easy to circulate to potential publishers and other interested parties. Previously, I have blogged about the beauty of Scrivener – and how ‘According to Claudia’ benefitted from a group reading which enabled me to hone it to perfection. The result is that it is now being produced on stage. I’ll be writing regular updates about the progress of ‘Claudia’ from page to stage. If you're a writer or anyone involved in theatre I hope you'll follow them and find them entertaining and useful.